UN ATT: REACHING FOR RESET? Dr. Stuart Casey-Maslen was unable to be present for the news briefing due to a family emergency and so was unavailable for comment. Dr. Casey-Maslen was a member of the Swiss delegation to the ATT negotiations. He was also on the ICRC delegation to the Oslo Diplomatic Conference in 1997 that adopted the 1997 Anti-Personnel Mine Ban Convention, which was a treaty that was developed outside the UN system and championed mainly by non-governmental organizations. Ms. Sarah Parker sat in Dr. Casey-Maslen’s place and has been a member of the Australian delegation during the UN ATT process. Ms. Parker was joined by Mr. Gilles Giacca who is a researcher and Ph.D. candidate at the Geneva Academy. The news briefing was led by Dr. Andrew Clapham, co-Director of the Geneva Academy and author of several books on international humanitarian law. 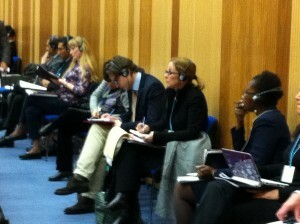 Dr. Clapham opened the news briefing, and then passed the floor to Mr. Gilles Giacca who spoke for about six minutes. This was followed by Dr. Clapham again for about 15 minutes. This left over 30 minutes for a lengthy question and answer session where nine questions were answered. The briefing was attended by over 100 people. One professional reporter self-identified and asked the first question at the end. 4. Geneva Declaration on Armed Violence and Development. 1. Defining the scope of the weapons to be regulated by the ATT. 2. Defining the criteria to be used to condition authorized international transfers of weapons subject to the ATT. 3. Defining the monitoring, compliance, reporting and implementation mechanisms of the ATT, for such things as the provision of victim assistance. 4. The US insisting on negotiating by consensus rules, and so creating the option for a single country to “spoil” the treaty. 5. The large gap between two main camps: those who want a narrow scope treaty, and those who want a broad scope treaty. He then detailed his main problems with the draft ATT, though he elaborated many problems as discussion developed into the question and answer period. His short-hand for three main problems were: 1) the complicity problem, 2) definition of war crimes, and 3) the balancing problem. 4. The treaty scope (e.g. the exclusion of tear gas and rubber bullets for example). 5. Ambiguity about the definition for ammunition, munitions. While Dr. Clapham acknowledged the ATT as a “trade” and “export” treaty at one point, his commentary was delivered as if the treaty was designed purely to serve as an instrument of global civil society improvement, one that is too important to be frustrated in any way by others concerned about national sovereignty, security, and business interests, and/or the principle of individual right to armed self-defense. The speakers were clearly frustrated with the draft ATT, and the negotiations process to date. It was not clear if this was indicative of just a distaste for the messy multilateral reality of accommodating diverse state interests, an acquired disdain for those diplomats and delegations guided more by how the world is rather than how the world should be, or both. Yet the mood was not entirely down. The room became guardedly positive when talk turned to the taking the ATT negotiation process outside the UN, to “do it right” as Mr. Giacca said on the Geneva Academy ATT Legal Blog post that was projected onto the wall behind the stage during the news briefing. This discussion thread developed in response to a question about the probability of Mexico, for example, leading a push to take the ATT outside the UN. But Dr. Clapham acknowledged a certain level of fatigue may set in and that diplomats and some humanitarian groups might just settle for a lowest common denominator to get the ATT done. He went on to state however that “there’s a good chance, that if people realize they are going to get something which is worse than nothing…and if the Mexican leadership…has the stomach for this, it could get taken outside the UN.” He went on to say this would allow for an ATT text to be approved “with only a two-thirds majority and we’d arguably get a much better text.” Sarah Parker, and Gilles Giacco also commented on this situation as well. The discussion got pessimistic again when Dr. Krause actually took the floor to make comments about Article 4 and the national assessment provisions. He essentially declared that the draft ATT, without fundamental changes, could result in a “pretty instrument that actually doesn’t change anything that actually happens in the world.” The reasoning being that weapons transfers would be subject to national assessment without any meaningful way for non-governmental organizations and other states to legally challenge a State’s own assessment process and decisions to export/transfer arms abroad, and this, in his words, would be “tragic.” Dr. Krause seemed to offer that another good reason to take the ATT outside the UN system would be for “limiting the scope of malicious interpretation” of the ATT by state parties. Sarah Parker, who works for Mr. Krause at the Small Arms Survey, then explained how provisions for increased accountability and transparency on national assessment could be added through an implemented “ATT system” when the “political climate” was better, eventually, after countries become “more comfortable” with the ATT’s obligations. She elaborated that a State’s own national assessment decisions could be made subject to legal challenges in international courts. Dr. Clapham even suggested how reports from Amnesty International and Human Rights Watch could eventually precipitate court-ordered injunctions halting government arms exports / transfers provided that campaigners and advocates first help bring about appropriate controlling national legislation. Dr. Clapham and Ms. Parker were presumably referring to more politically open states only, and the United States especially. Dr. Clapham, Mr. Giacca, Dr. Krause, and all seemed hopeful for an ATT negotiated outside the UN system (i.e. without consensus rules, with fewer countries required for an ATT to enter into force, with higher standards, broader scope, better text overall etc). Ironically for them and like-minded partners at the ICRC, Oxfam, and Saferworld, realizing these hopes now seems best assured if nations don’t reach consensus at the UN ATT Conference in March. Will humanitarian rights groups and sympathetic state delegations help move the UN ATT Conference talks forward by consensus, or will they act to kill consensus themselves? Deliberately killing consensus will hit the ATT reset button and would be hypocritical at the very least, particularly since such groups were the first to accuse the United States and others of doing this in July. Regardless of who might kill consensus in March, doing so will certainly lead to further institutional division within the international system. With Syria now in a full civil war, and the risks of major regional conflict accelerating, more division seems the last thing the world now needs. The downloadable audio for this conference is just under 53 minutes and 7MB. It is complete except for the first few minutes of introductions. The only edits made to the audio file were to enhance voice and minimize noise. This said, there are some points where noise may make it difficult to clearly understand speakers. You can download it here. The first session of the UN ATT Conference was held from 3 -28 July and ended with no action on the final draft treaty dated 26 July 2012. A .pdf version of this draft ATT is available here. The Geneva Academy of International Humanitarian Law and Human Rights website is here. According to the back of the briefing cover, the Geneva Academy “provides post-graduate teaching, conducts academic legal research, undertakes policy studies, and organizes training courses and expert meetings;” and “concentrates on the branches of international law applicable in times of armed conflict.” A .pdf of the Academy Briefing is available in here. A draft resolution before the First Committee of the United Nations is available at here. The stated authors of the briefing acknowledge collaboration from Roy Isbister, Claire Mortimer, and Nathalie Weizmann on the front inside cover of the Academy Briefing. These individuals are well-known representatives of Saferworld, Oxfam, and the ICRC respectively. While a disclaimer states the views expressed “do not necessarily reflect those of the project’s supporters or of anyone who provided input to, or commented on, an earlier draft,” previous public statements by these individuals indicate strong concurrence with the briefing by these individuals and their respective employers. You can learn more about the Small Arms Survey here. Mexico is most likely to lead the effort to reset the ATT negotiations outside the United Nations based on its prior statements and actions during ATT negotiations process since 2009. At the conclusion of the UN ATT Conference in July, they spoke on behalf of 90 countries signaling a clear willingness represent the interests of other like-minded states. A .pdf of this statement is available here. “Academy Briefing No. 2: The Draft Arms Trade Treaty.” Geneva Academy of International Humanitarian Law and Human Rights. 30 October 2012. Page 31. Mr. Giacca made reference to the problem of consensus rules and the US insistence on them in his remarks. A .pdf of the press statement announcing the US support for the ATT negotiations with consensus rules is available here. Dr. Clapham specifically identified the US as creating the balancing problem when answering the first question from the audience. You can hear this starting at 20 minutes and 19 seconds in the audio file referenced above. A .pdf of the blog post presented during the news briefing is available here. Among the people making comments at the news briefing, Ms. Parker was alone in declaring her preference for a treaty by consensus through the UN system. Here are links to press releases from Reuters, Oxfam, Amnesty International, and Control Arms. Sources last accessed 5 November 2012. Online republication and redistribution are authorized when this entire publication (including byline, hyper-links, and Indexed Audio, About the Author and End Note sections) and linkable URL http://tsmworldwide.com/reaching-for-reset/ are included. Mr. President, I am Sheldon Clare, President of Canada’s National Firearms Association. Our members are collectors of everything from cartridges to fully automatic firearms; they’re sports shooters and Olympic competitors, wholesalers and retailers, re-enactors, members of the movie industry, hunters, people who hand load ammunition, and those who own firearms for defence. Our members are concerned that UN attempts to regulate trade in arms are misdirected and will have an unfair and unreasonable effect upon the ability of free people to have access to firearms and ammunition for perfectly legitimate purposes. It is a false premise that civilian access to small arms is the problem. Canada’s National Firearms Association (NFA) recommends that controls on small arms and light weapons be limited solely to major weapon systems possessed or sold by nation states – not firearms owned or desired to be owned by civilians, also called non-state actors. The rights and property of Canadians, and our firearms businesses engaged in the lawful trade in firearms and ammunition, including surplus firearms and ammunition, must not be subject to UN edict or control. Quite simply, these are matters of national sovereignty, civil freedoms and property rights, and are related to national culture. Also, marking and accounting for ammunition would be exceptionally onerous and expensive for manufacturers and firearm owners alike. Control of ammunition would be unreasonable, unnecessary, and impossible. The proposed Implementation Support Unit (ISU) could potentially serve as a form of promotional and enforcement agency for the ATT and thus interfere with national sovereignty over laws affecting firearms ownership and use. It could be used to operate a form of international registration system. Funds given to this body and other initiatives such as the Victims Assistance Fund could be directed to terrorist states. Supporting these potentially huge and inappropriate expenses is not in the best interests of Canadians. Reducing arms in civilian hands can significantly limit the ability of people to defend themselves. This is especially important in the event of unrest and disorder, or in case of state-mandated crimes against humanity. Civilian ownership of arms is an important factor in preventing and limiting the effect of events such as what occurred in Sebrinica and Rwanda. While governments need to act against terrorism, perhaps better ways to deal with unrest would be to address the economic situations, political differences, and human rights issues that contribute to people agitating for change. A global ATT would only be in the interests of those who would seek economic advantage by limiting market opportunity and of regimes who would use such a treaty to disarm their citizens in order to rule through fear. Thank you for your consideration Mr. President.